Like everybody else in America, I was interested in the George Zimmerman case, though I did not follow it obsessively or watch the trial. Like many, I was upset at the verdict, though unfortunately, it was set up to fail from the beginning. Martin was scared for his life and fought to preserve it against his stalker; you can’t blame him for what he did. However, it seems Zimmerman was indeed scared for his life, too, when he shot him. He should be held accountable for setting up the situation by stalking Martin without cause. Then I saw a photograph of Zimmerman in a daily e-mail I got this morning from the Huffington Post. The photo linked to a story stating that he is getting his gun back. 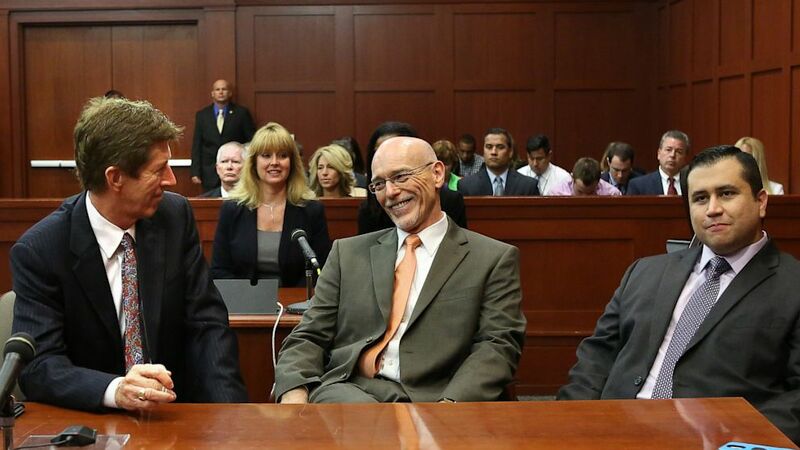 Posting the picture here would be violation of copyright and probably get me into legal trouble with Getty Images, but a link is here (picture #10 in the slideshow, with caption, “George Zimmerman (R) sits with his defense team, Mark O’Mara (L) and Don West (C), waiting for the jury to return from deliberations in Seminole circuit court July 13, 2013 in Sanford, Fla. (Joe Burbank-Pool/Getty Images)”). It may have been rare, but that one moment captured an telling emotion: He looked like the cat who swallowed the canary. From the caption, the jury hadn’t even finished deliberating yet, yet he looked like this, like he already knew he would win. I sometimes have trouble with more subtle expressions–especially if I can’t figure out the reason for them–but I have studied facial expressions over the years, and this one is clear as day. Then a second thing struck me: Oh my gosh, that’s the exact same expression on Richard‘s face in the mug shots he took on November 1, 2011, after the guilty verdict. He pled no contest and was convicted of choking his daughter, but all he got was a year’s probation, no jail time unless he were to screw up. When I found the mug shots posted online by the state (our state makes such records free and open to the public here), his expression looked like contempt to me. I looked up my printouts just now of those mug shots, and sure enough, there’s Zimmerman’s expression. More potential sociopathy: Allegedly Zimmerman also molested a family member; she said she came forward when she did because he was finally off the street. “With him, he like, he was a different person to me. He was very intimidating and the fact that he made everyone love him and made everyone laugh and be so happy around him, I knew if I said anything he would just deny it,” she said. “This is the first time in my life that I’m not afraid of him,” the woman said. “[H]e cant get to me. Huh. Sounds like–contrary to the jeers of Richard and Tracy–feeling this way about seeing your abuser again is PERFECTLY FRICKIN’ NORMAL. I’m also discovering, through reading various blog posts and comments, that abusers calling you crazy and accusing you of lying about the facts, is also extremely common sociopathic/narcissistic behavior. My two narcissistic exes did it, too. So when your abuser does this, like mine did, don’t let them gaslight you: Take it with a grain of salt and consider the crazy lying-a** source. They’re just projecting their own crap onto you. The more you research, the easier it gets to recognize sociopaths. And you begin to see just how many there are in the world.